We study the impact of heterogeneity of nodes, in terms of their energy, in wireless sensor networks that are hierarchically clustered. We assume that a percentage of the population of sensor nodes is equipped with additional energy resources - this is a source of heterogeneity which may result from the initial setting or as the operation of the network evolves. We show that the behavior of such sensor networks becomes very unstable once the first node dies, especially in the presence of node heterogeneity. Classical clustering protocols assume that all the nodes are equipped with the same amount of energy and as a result, they can not take full advantage of the presence of node heterogeneity. We propose SEP, a heterogeneous-aware protocol to prolong the time interval before the death of the first node (we refer to as stability period), which is crucial for many applications where the feedback from the sensor network must be reliable. SEP is based on weighted election probabilities of each node to become cluster head according to the remaining energy in each node. Our SEP protocol successfully extends the stable region by being aware of heterogeneity through assigning probabilities of cluster-head election weighted by the relative initial energy of nodes. Due to extended stability, the throughput of SEP is also higher than that of current (heterogeneous-oblivious) clustering protocols. 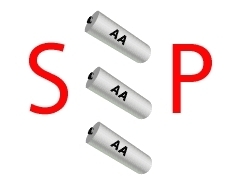 The performance of SEP is observed to be close to that of an ideal upper bound obtained by distributing the additional energy of advanced nodes uniformly over all nodes in the sensor field. 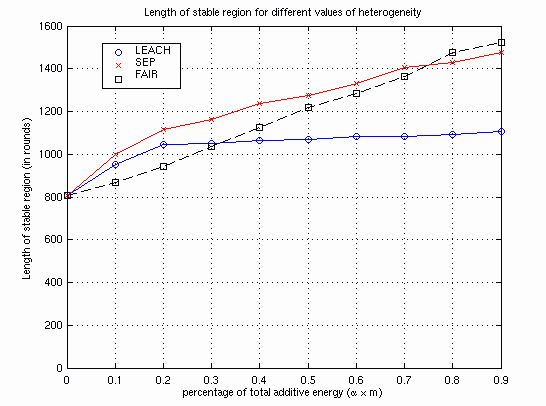 SEP is more resilient than LEACH in judiciously consuming the extra energy of advanced nodes - SEP yields longer stability region for higher values of extra energy. "SEP: A Stable Election Protocol for clustered heterogeneous wireless sensor networks"
Georgios Smaragdakis, Ibrahim Matta and Azer Bestavros. Second International Workshop on Sensor and Actor Network Protocols and Applications (SANPA 2004). Sponsors: The SEP project is supported partially by a number of National Science Foundation grants, including CISE/CSR Award #0720604, ENG/EFRI Award #0735974, CISE/CNS Award #0524477, CNS/CNS Award #0520166, CNS/ITR Award #0205294, and CISE/EIA RI Award #0202067.